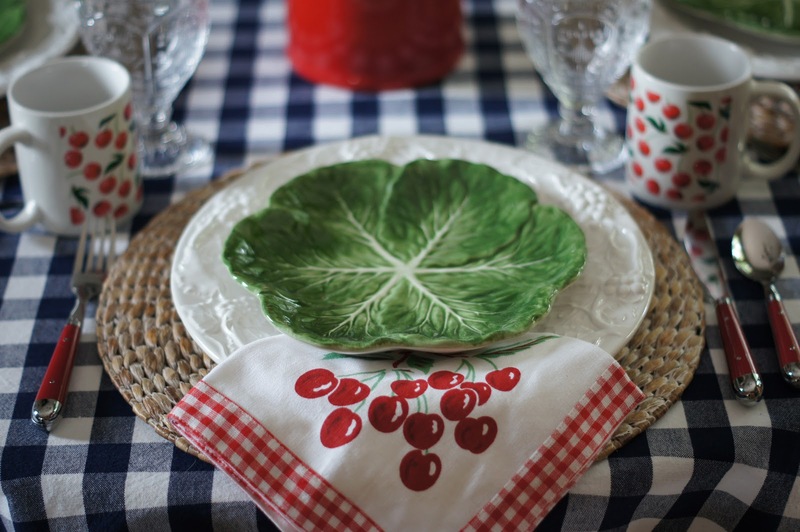 Cherries are in abundance in today's tablescape! 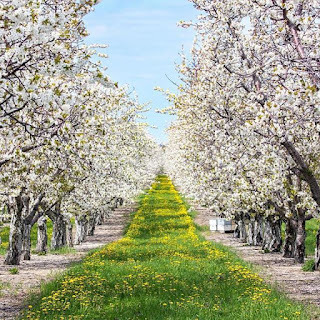 The cherry orchards have been in full bloom in the Grand Traverse region where I live. Our area produces 75% of the tart cherries in the world. Approx. 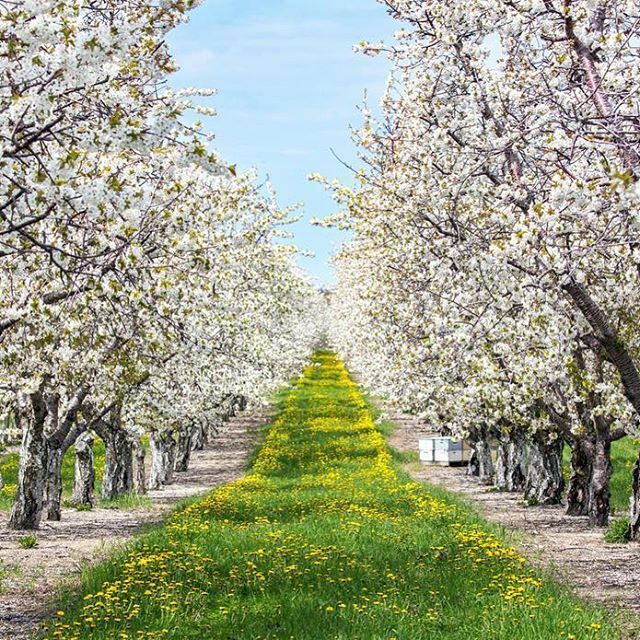 600,000 sweet cherries come into bloom first in early May and then the 2.6 million cherry trees come into bloom later in the month. There are a lot of orchards in the region. So I have cherries on my mind! 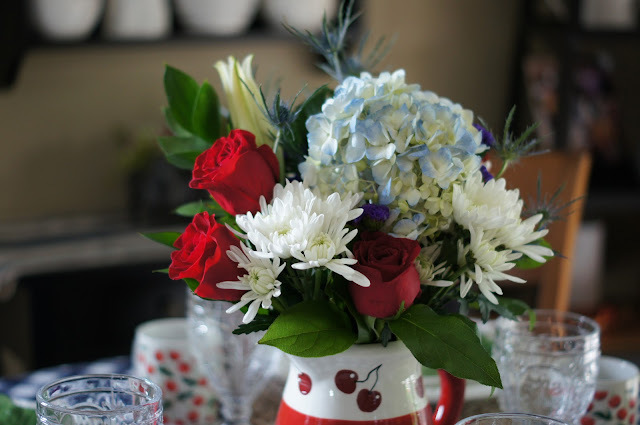 I used my cherry pitcher for a beautiful bouquet of reds, whites and blues. 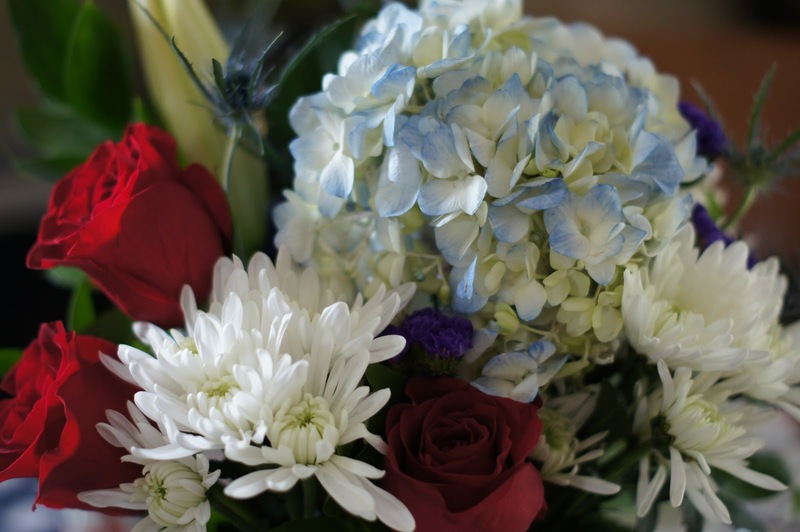 I love that soft blue color of this hydrangea and the red roses couldn't be any prettier with it. 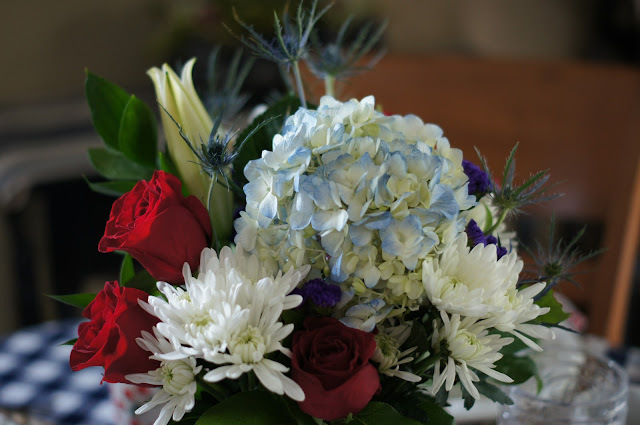 A white lily is soon to open and the blue thistle made for a wonderful accent! I had some cherry coffee mugs tucked away to add and I pulled out my cherry napkins. We enjoy a good cup of coffee here (even decaffeinated). I found the woven chargers at Home Goods on a visit there last month. The blue and white checked tablecloth has been around for several years. I should use it more often! The green cabbage plates helped bring in color and added to the garden theme. My mind was thinking of summer and fresh vegetables from the garden so I combined it all together! We're expecting heavy rains soon from the tropical storm remains of Alberto and it's become very gloomy and muggy outside. I'm glad I have these beautiful flowers to enjoy inside because it's going to be wet and rainy for a couple of days now. It's been a dry spring so we really can use the rain. 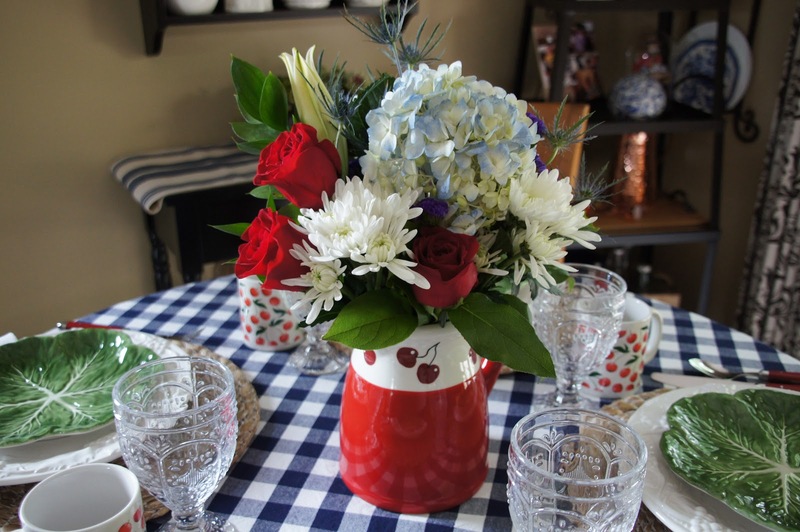 I hope you enjoyed my Cherry Garden Brunch! 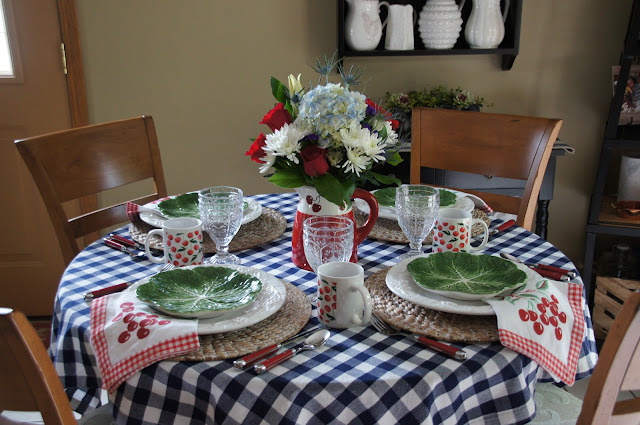 Cherry napkins came from local stores as well as the pitcher and coffee mugs. Love, love,love it. How fun. Local grown cherries, u lucky lady! 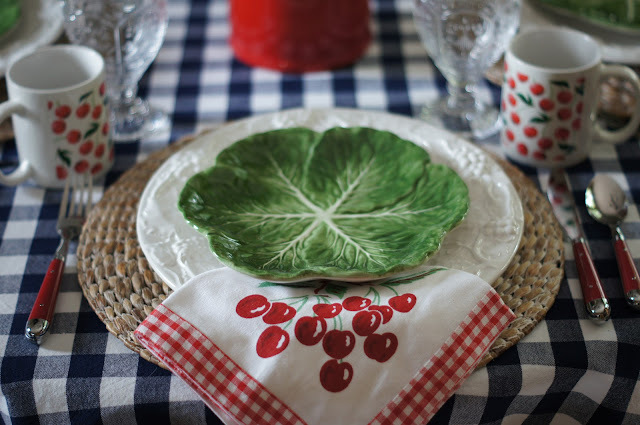 One of the finger sandwiches I'm planning for my Alice themed iced t a party features cherries. They'll make me think of u.
I didn’t realize all those cherries come from your area!!! Now I’ll think of you every time I make a whiskey sour, a daiquiri, or a cherry pie! 🍒🍒🍒 We had a couple of cherry trees in our backyard when I was growing up (mowed down to make room for the pool🤬), but I’m sure the quality and taste would not have compared to what’s produced there. 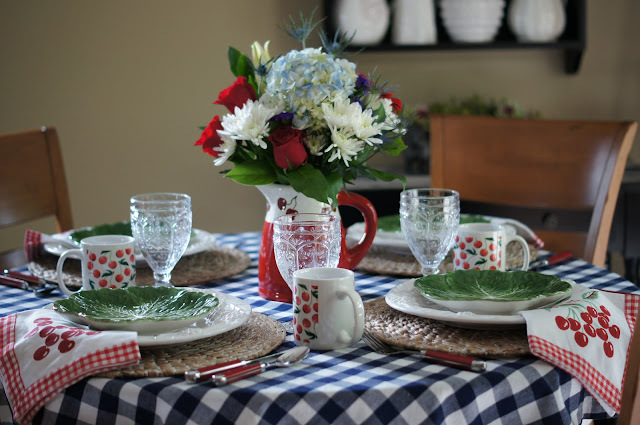 I really like this tablescapes. It’s got a nice mix of color, pattern, and texture. Really well balanced. 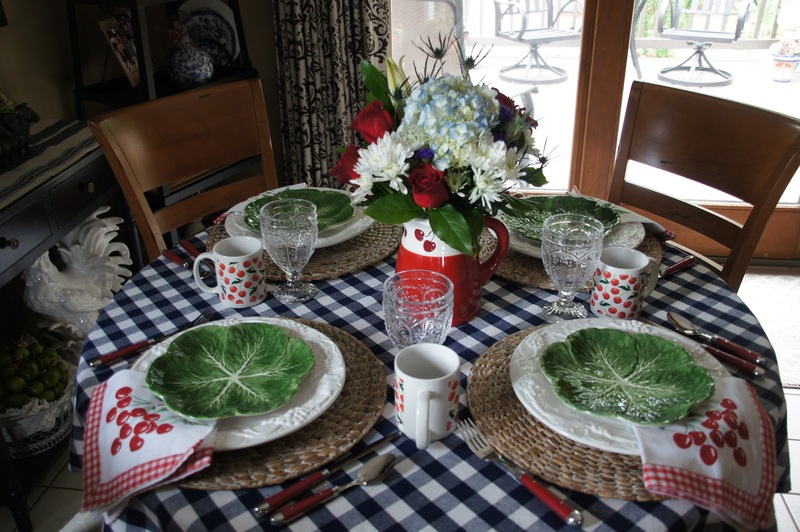 What a great way to use the cabbage plates! Thanks for the shout out to decaf coffee!!! I’m a fan! I was hanging onto spring, but seeing your cherry table I'm ready to move to summer! Fresh cherries are one of the delights of summer. I have two cherry trees in the front, but they are non-fruiting. Love the napkins. How colorful and sweet!Love your pretty floral bouquet! Such a sweet table for a garden brunch. 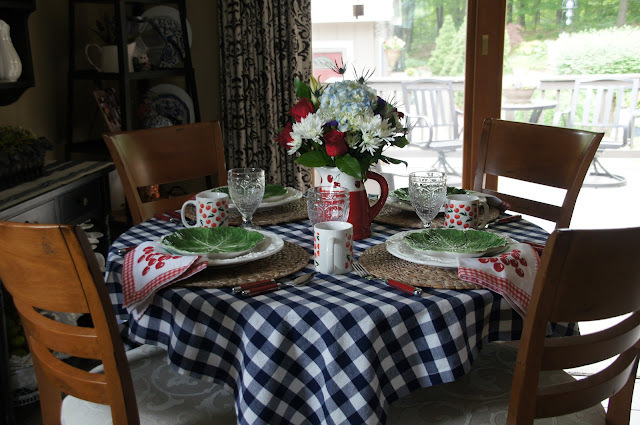 Love the cherry napkins and mugs. Fresh cherries are so tasty on a hot summer day. The floral arrangement is so pretty. This is an absolutely charming tablescape!! Love the cherry theme and the checkered table cloth!! So Pretty!! Congrats on the feature!! I did enjoy your cheerful, cherry table, Liz! Everything just works and looks so pretty together. I have a tablecloth like yours, only in black and white checked. Thanks for the inspiration!